Jon Sibal is an old teammate (from a former crew called ArtnMotion) who is a great artist that works in the Comic book industry. In his spare time he makes concept car renderings for project builders and just to amuse himself. There have been spy photos of the Mercedes McLaren SLR Speedster on all the blogs so Mr. Sibal decided to render out a better looking concept than the one that’s being used as a test mule. 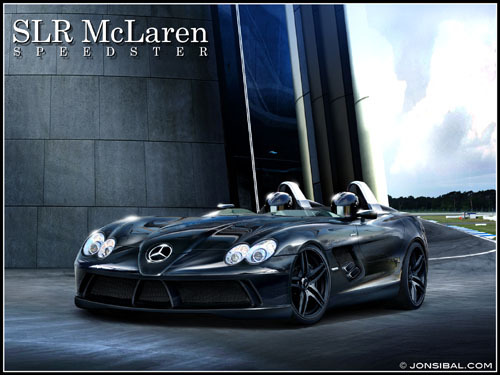 I sure hope the real SLR Speedster looks as mean as his concept. This is another ride for the Dark Knight!